Just when I think cinnamon bears can’t make me any happier, they surprise me. 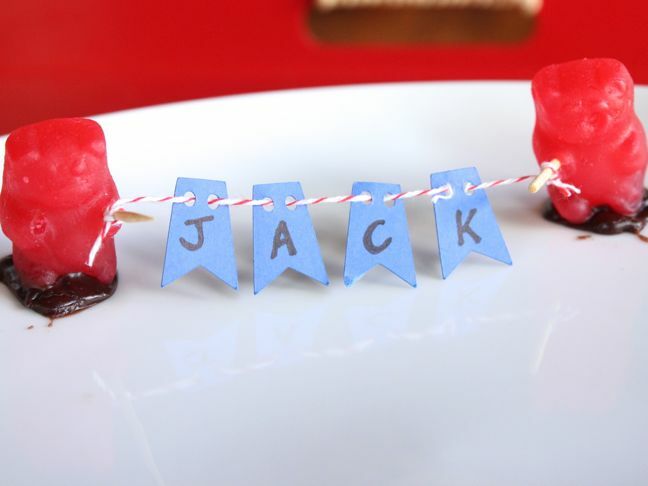 Not only do the sweet and spicy bears leave me reaching for handful after handful, but their bright red color and body position also make them highly qualified to be the perfect place card and flag prop for Fourth of July patriotic celebrations. 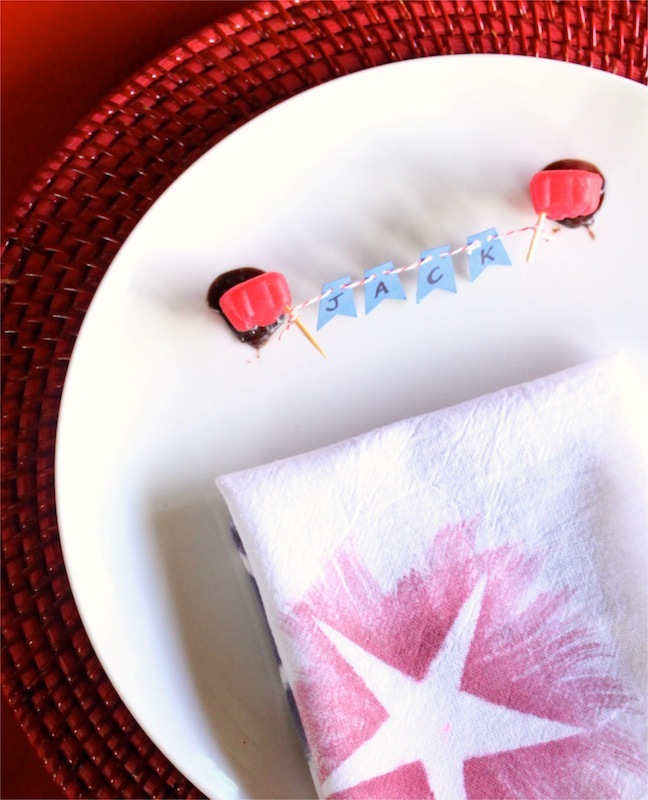 Here’s how you can set your patriotic table with the bite-size gelatin treats…perfect for the kids’ table (and heck, the adults’ table, too!). Step 1: Cut mini flags for the name banner and punch two small holes on the top. 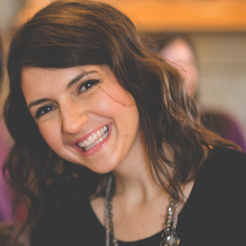 Step 2: Write the letters of your guests’ names on each flag. Step 3: String red and white twine through the flags. 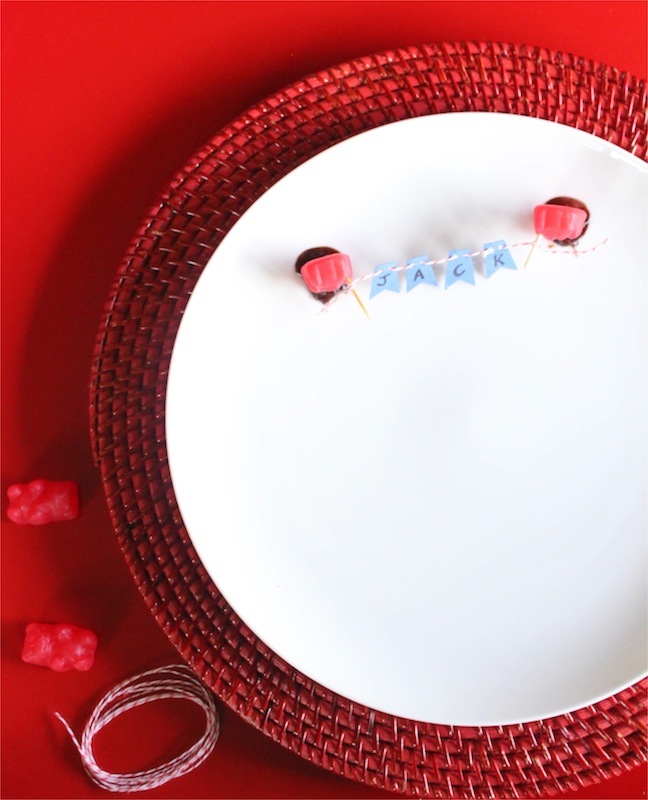 Step 4: Break one toothpick in half, and insert toothpicks in the cinnamon bears hands. Step 5: Tie one end of the string to one toothpick, and repeat on the other toothpick. Step 6: Dab sugar cookie frosting in two spots on the edge of the plate to hold the bears in place. 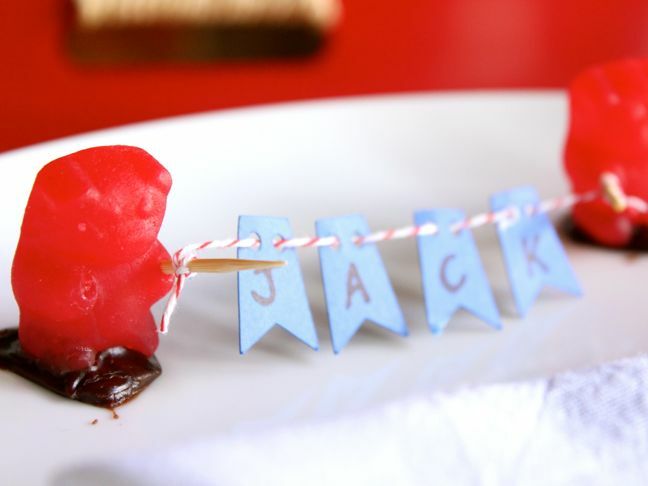 Measure the approximate distance of the name before you add the frosting to the plate. Step 7: Place the bears on the frosting. You will need “props,” such as a spoon or cup, to keep the bears upright and in place for five minutes while the frosting hardens. Step 8: Once the frosting hardens, remove props and set the table with your adorable, semi-edible place setting.